Hub City Furniture, is located at 429 Lincoln Hwy across the street from the Post Office in downtown Rochelle, IL, Hub City Furniture has been "around", on and off, since the 1950's. At that time, the store included one-half of the downstairs and all of the upstairs. Today Hub City Furniture fills the entire floor level as well as the upper level with quality home furnishings for you and your family. Hub City Furniture has been under the current ownership since 1979 and located in this building since 1984. Stop by and visit. We will be glad to assist you with your home furnishing needs. 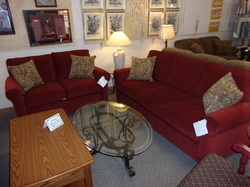 Living room sets, dining room sets, bedroom sets, mattresses, recliners and more. Whether you are in the market for an entirely new living room or just a new piece of furniture to dress it up, Hub City Furniture will be glad to assist you with all your furniture needs. 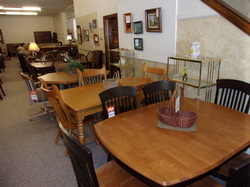 Hub City Furniture carries formal as well as casual kitchen and dining room sets. Whether you want wood or metal, large or small, we can take care of your needs. 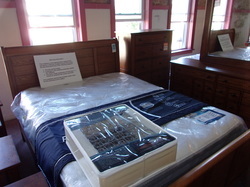 If you are in the market for a new bedroom set or a new set of bedding, the upper lever at Hub City Furniture can probably fit your needs. ​Stop by today to see our selection.